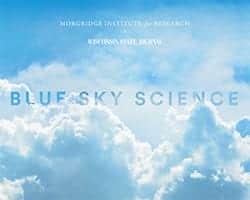 News & Stories > Blue Sky Science > Why do hissing cockroaches hiss? Why do hissing cockroaches hiss? They can hiss for a number of reasons. First and foremost, if you disturb them—like picking them up abruptly or shining lights on them— they send a hiss as sort of an alarm signal to other members of their colony. Within their colony, hissing can be used for several other functions. Males sometimes hiss if they are fighting with each other and showing aggression. The males will also hiss in part of the courtship and mating rituals with the females. These hissing noises are distinctly different. If you were to record them, you’d be able to distinguish between an alarm versus an aggression versus a courtship hiss. The Madagascar hissing cockroaches have a really interesting way that they produce this audible hissing noise. Insects in general have openings on the side of their bodies called spiracles. These lead to air ducts and are essentially how insects breathe. Oxygen can diffuse in, and carbon dioxide can diffuse out. Hissing cockroaches have specially-modified spiracles. If they expel air from them quickly, it produces the hissing noise. It would be like if you took a soda straw and blew through it really quickly. We’d get a whooshing of air and hear a little bit of a hissing noise.